On Monday, the epic three-night Jeopardy battle begins when IBM's supercomputer Watson will take on the game show's two greatest champions, Ken Jennings and Brad Rutter. On the line is a $1 million prize, and the pride of both human contestants as well as IBM's reputation as a pioneer in machine learning. Early indications suggest that Watson will be favored in its competition against Jennings and Rutter since the supercomputer already beat its opponents in a practice round in January. But Watson is not an unstoppable machine and does have its weaknesses, especially if the clue involves a high degree of wordplay or ambiguity. For an interesting take on Watson's weaknesses, check out Fast Company contributing writer (and former Jeopardy champion) Greg Lindsay's take on Watson after playing the supercomputer in 2010. It's anybody's guess who will win tonight, but in honor of what may be Watson's intellectual triumph over humanity, here is a look at the rise of the supercomputer in human history. Watson is based on IBM's Deep QA project, which is attempting to create computers that can mimic the human ability to comprehend and answer natural language questions. The computer features 15 terabytes of RAM and about 2880 processor cores, can perform 80 trillion operations a second, and is the size of ten refrigerators. 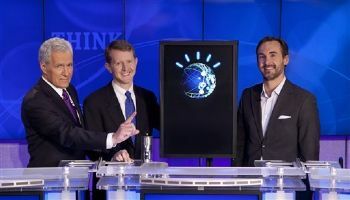 Watson is seen as a giant leap forward in artificial intelligence because to play Jeopardy it had to understand and answer English language questions using idioms and common expressions. This is unlike previous computers, which required specific input keywords before they could respond to human speech. 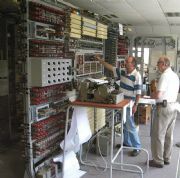 Colossus was the first large-scale electronic programmable computer and was built by the British in 1944 during World War II. Colossus was designed to help Allied forces decrypt messages encoded with the Lorenz cipher sent from German High Command to Nazi officers in the field. The machine was powered by about 1500 vacuum tubes, received input from paper tape, and sent its output to a typewriter. It took about six hours for Colossus to decrypt a ciphered message, according to a BBC report. A total of ten Colossus machines were built during the war. 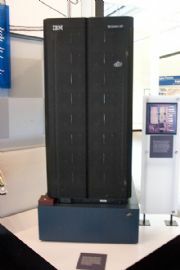 The first supercomputer developed by the Cray Research Company, known for its supercomputer prowess, the Cray-1 was first sold to the Los Alamos National Laboratory in New Mexico in 1976. The machine cost nearly $9 million and could perform (at top speed) 160 megaflops (160 million operations per second). It conducted these operations with 8 MB of memory. The machine stood about 6.4 feet tall by 8.5 feet wide by 8.5 feet deep and weighed 5.5 tons. 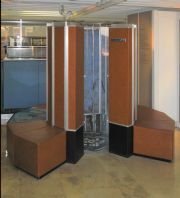 The Cray-1 also had a Freon-based cooling system to keep it from overheating. One of Cray's most famous customers: Apple Computer. Perhaps one of the most legendary supercomputers of all time, IBM's Deep Blue was developed specifically to test a computer's capabilities to play chess. The machine featured 30 120MHz processors and performed at 1 teraflop (1 trillion operations per second). This version of the machine played a rematch with world chess champion Gary Kasparov after losing to the champ in 1996 by 4 matches to 2. But a 1997 rematch didn't go as in the previous tournament, and Deep Blue ended up beating Kasparov 3.5 to 2.5. Kasparov resigned the final game in frustration saying, "I lost my fighting spirit." NASA's Columbia supercomputer was a collaboration between Silicon Graphics International, NASA, and Intel in 2004. The system, housed at NASA's Ames Research Center in Mountain View, California, features 10,240 Intel Itanium 2 processors and 27 terabytes of RAM. Columbia uses SUSE Linux Enterprise as its OS. The machine was designed to help NASA construct large-scale environmental models such as hurricane track prediction and global ocean circulation. Columbia also helps analyze the physics of supernova detonations and other large events occurring in outer space. NASA says the first super computer at Ames could do 1 billion calculations per second. Columbia is 50,000 times faster than that. Columbia was named in honor of the crew of the Space Shuttle Columbia who died during reentry to earth on February 1, 2003. The Jeopardy-IBM challenge lasts three nights, running from February 14 through 16.